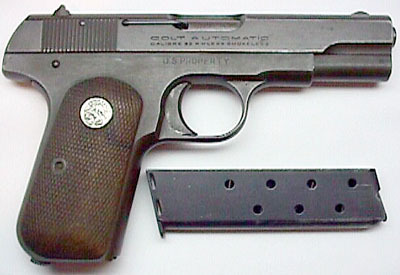 An early military Model M .32 ACP pistol, blued finish, serial number 555420, with U.S. PROPERTY mark on right side of frame and "W.B." 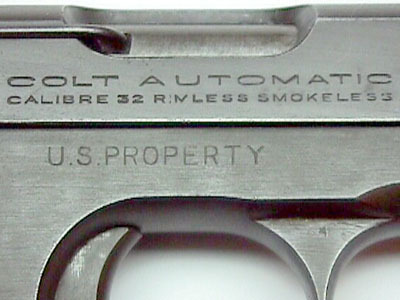 ordnance mark on the upper left flat of the trigger guard. 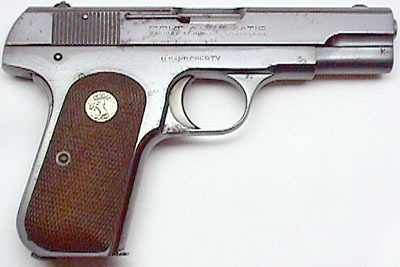 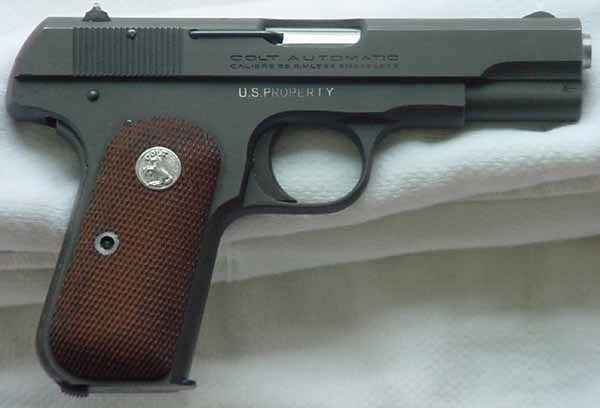 Pistol was one of 100 shipped to United States Government on February 4, 1942. 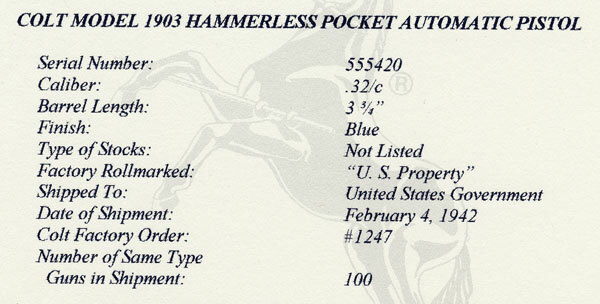 Processed on Colt Factory Order number 1247. 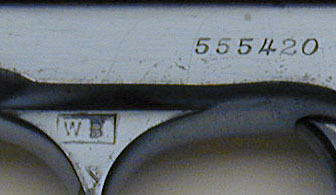 The initials W.B. 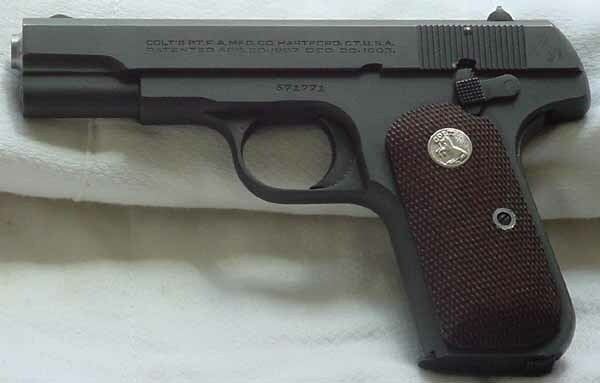 are for Col. Waldemar S. Broberg, Army Inspector of Ordnance from July 1, 1941 to June 16, 1942 at the Hartford/Springfield Ordnance District. 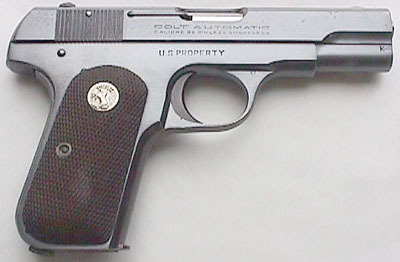 An early military Model M .32 ACP pistol, blued finish, serial number 558682, with U.S. PROPERTY mark on right side of frame and "punch dot" ordnance mark on the upper left flat of the trigger guard. 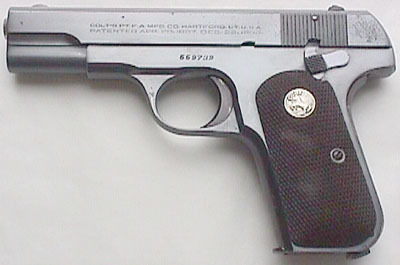 Pistol was shipped to the G-2, Pentagon, Washington, DC in the 1940s. 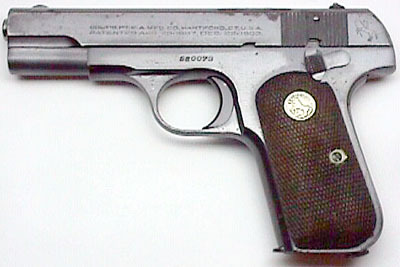 Model M .32 ACP serial number 559739, shipped in a shipment of 320 pistols on September 8, 1944 to the Office of Strategic Services (OSS), Fowler Building, Rosslyn, Virginia and issued to Capt. 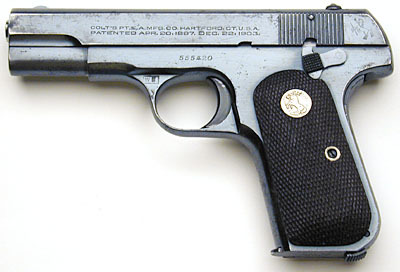 Maurice M. LeBreton, U.S. Army, who served in the India, China, Burma Theater in WWII. 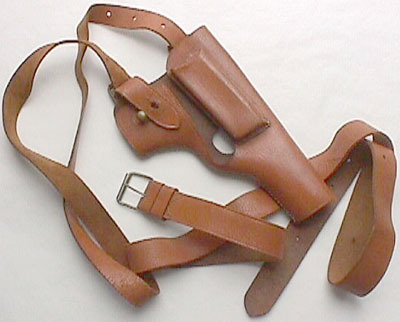 This pistol is accompanied by an unusual leather shoulder holster with a finger cut-through that allow the pistol to be fired from the holster. 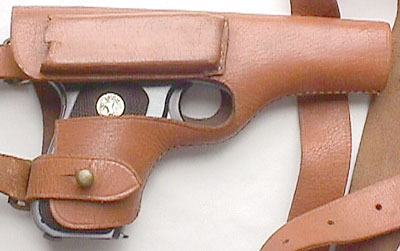 Close-up of the front of the shoulder holster with Model M serial number 559739. 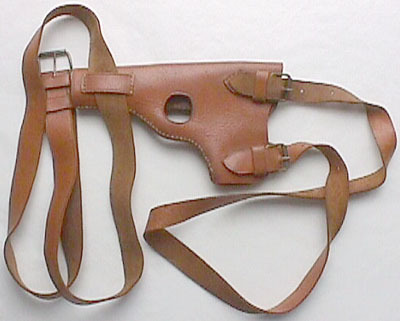 Back view of shoulder holster for Model M serial number 559739. 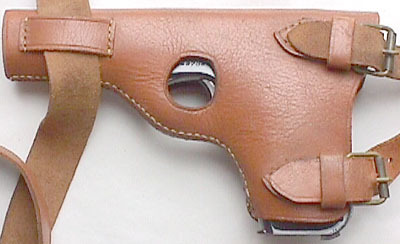 Close-up of the back of the shoulder holster with Model M serial number 559739. 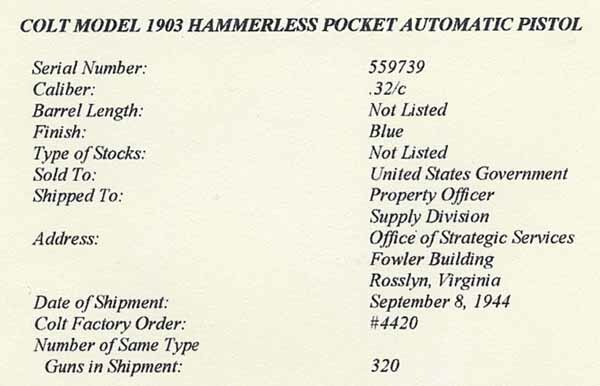 Model M .32 serial number 560073 - Colt factory letter confirms shipment to the Office of Strategic Services, Fowler Building, Rosslyn, VA in 1944. 1944 Production Model M .32 ACP serial number 569158 - pistol has phosphate (parkerized) finish, "U.S. PROPERTY" mark on right side of frame and ordnance wheel located behind thumb safety. 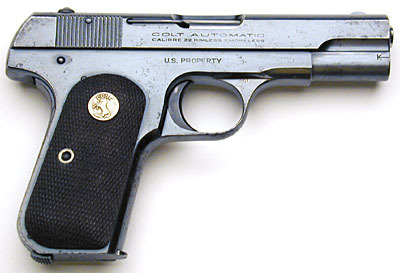 Colt Model M .32 ACP U.S. PROPERTY serial number 571771 - Factory letter indicates this gun was one of a shipment of 504 pistols to the United States Government, Commanding Officer, Washington Quartermaster Depot, Cameron, Virginia for Property Officer, G2/MIS, Room 2-B 731, Pentagon Building, Washington, D.C. on February 20, 1945. 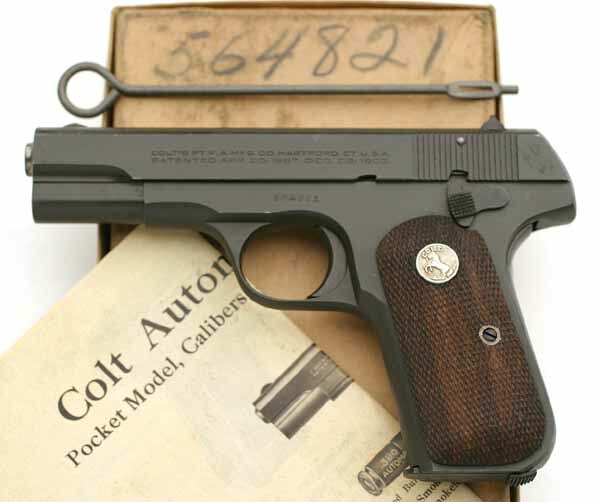 Colt Factory Order Number #5000. 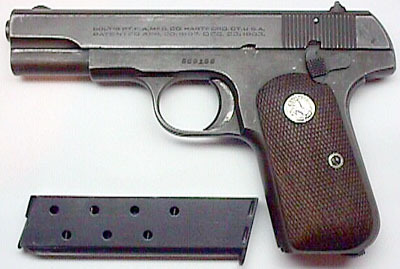 Right side of Colt Model M .32 sn 571771. 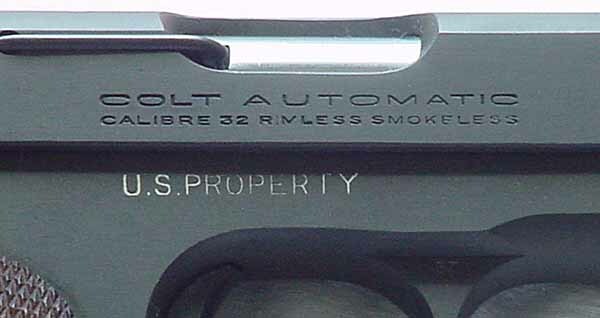 Close-up of U.S. PROPERTY marking. 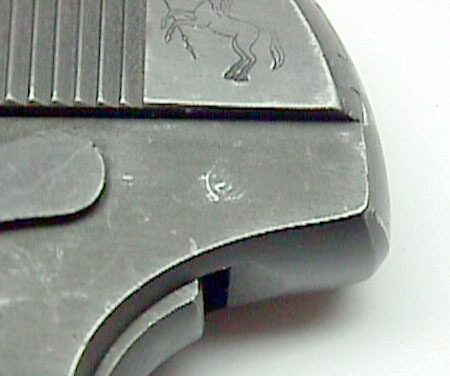 Note: marking is filled with white chalk for contrast when photographing.